Tri-color Couscous is a traditional couscous blended with a balanced proportion of spinach and tomato flavored couscous. It is a tiny pearl of pasta, about the size of a pinhead, with a neutral flavor and colorful presentation. 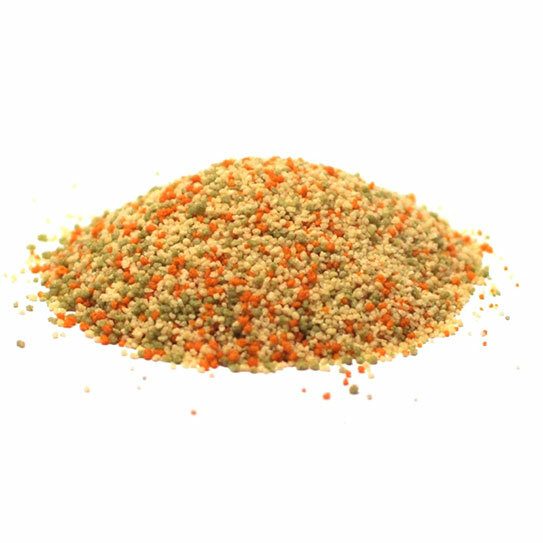 Whether prepared hot or cold, Tri-color couscous is versatile and absorbs flavors well. This is the smallest of all couscous varieties and cooks in just 5 minutes. Couscous originated in Northern Africa is made from durum wheat Semolina Flour. The Semolina is moistened with water and rolled until little balls are formed. Rainbow couscous offers a chef a colorful presentation with minimal labor.